The North American Crane Working Group will be hosting the 15th North American Crane Workshop on 8-11 January 2020 in Lubbock, Texas. Please submit proposals for Symposium topics to Program Chair Sammy King (Sking@agcenter.lsu.edu) before 31 May 2019. Submissions should include the title, a brief (<1 page) description of the symposium and why it would be of interest, as well as prospective presentation titles and the names and affiliations of potential presenters. Please note if the presenter has confirmed willingness to present the paper. Decisions on symposia will be based on potential interest of attendees and program space and will be made prior to the 15 June Call for Abstracts. Proposals have already been received for Symposia on issues affecting cranes on the Texas High Plains and on the expanding breeding range of North American sandhill cranes. 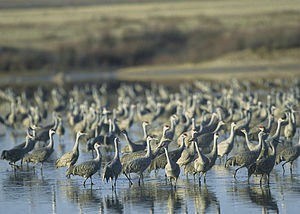 Sandhill Cranes at Muleshoe National Wildlife Refuge.